As the days wind down, my greatest regret is that I could not capture the most compelling aspects of this journey for you. The discussion, laughter, and candor that often occurs only when the camera is turned off. Today was no exception. I pulled off in Lyman, Wyoming when I caught sight of a weathered Cowboy Cafe sign to my right. Probably the best representation of a ‘local’ cafe it is in possession of the absolute best Green Chile Stew to date. This accomplishment just steps away an independent gas station and the interstate cannot be overstated. 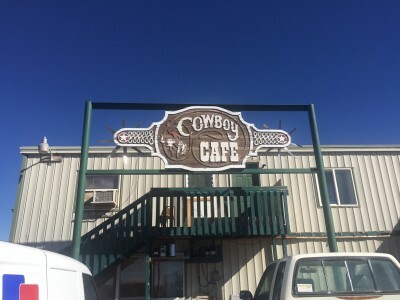 It is filled with locals and enjoys a staff that is friendly and connected to this distinctly Wyoming community. Please meet Tyra, recently engaged and from Colorado originally, her insights on Lyman and what really matters here is remarkable. What I love is that this perfectly captures two repeated themes. It starts with a dire hyperbole (doomed) and then the top of mind single issue (guns) that concerns the speaker and, in this case, the community. But my favorite part occurred moments later when my camera was placed on the stool beside me. Tyra explained the importance of being able to protect yourself in a rural area. When the subject turned to background checks, gun registration and semi-automatic weapons bans, we were surprisingly in alignment. When I mentioned that my understanding was that Hillary did not want to ban guns, but to enact legislation in these three areas, there was a pause. And like Mr. Beasley, it probably did not indicate agreement. But it was cool. Somewhere in the third week of these quadrennial treks of mine, I have a melt down. The specifics vary, but the result is a loneliness so profound as to stop me in my tracks. It happened today as the first ominous storm was forming on the horizon. God was clearly playing along. I believe that this is an unavoidable element of a journey like this and the actual triggers are secondary, but I would like to share this year’s meltdown with you. It took days to digest the news and the experience of the rallies. Add to that, the growing concern over the sheer amount of ‘misinformation presented as fact’, I was finding writing and interviewing increasingly difficult. My first message today came from a man I respect very much. Well educated and astute, he had been on the original distribution of the ‘little Shakiel’ email. Because I had sourced Politifact in my response, he wrote to share a study that shows Politifact bias against Republicans. My heart sank. Invalidating data has become a predictable response. I read it carefully and could see (kind of) how they came to their conclusions. My less evolved self was thinking ‘well if the Republicans would just stop shoveling so many lies, maybe they would not be targeted’ but I digress. The family was created to be an institution, and that institution has a purpose and function in God’s order for the things: to expand the dominion of God’s people over the whole world (Gen. 1:27-28). The purpose and function were first given to the man, and he is supposed to be the chief carrier and executive of that function. And just as the woman was uniquely designed and gifted to discern and understand the issues of relationships, the man was uniquely designed and gifted to fulfill the purpose of taking dominion over the earth. The father’s and the husband’s position of the man is not primarily focused on relationships – that’s what he was given a wife for. That responsibility is given to man to ensure that his family fulfills its purpose in the plan of God in conquering the earth. Man’s very being is outward-oriented, not inward-oriented. His interests would be in work and war, not in feelings and relationships. I will not even parse the whole ‘dominion over the earth’, let alone it’s ‘conquering’ or ‘what he was given a wife for’ but suffice it so say, this was my trigger. Allow me to summarize: I send data from a Pulitzer Prize winning website and was debunked by a study re-published by a man who will not even identify himself for fear of the gays, while making a case for his Biblical dominion over the earth and his wife. 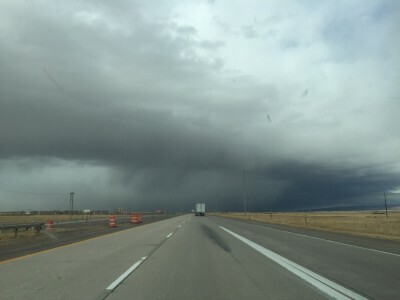 I closed my laptop and prepared to drive into the storm that had formed outside. Enter Scott. A Wyoming techie, this poor guy had no idea what he had just walked into. After a brief introduction, (I had every intention of of making a hasty retreat) he made the mistake of sharing that his biggest concern in this election was the possible manipulation of the results. I’ll own this. I snapped. I launched a verbal tirade on the recent proclamations of the Trump campaign and the very threat that they posed to our democracy. I think I was eloquent, but it is equally possible that I was shrill. And then this happened. Scott asked me to listen to him. He explained it was important, because how else could we work this out? This guy totally stole my bit. He proceeded to ask me questions. What the hell? Aside from my disappointment that he did not want to be recorded, it turned out to be a complex and in depth reasonable exchange of shared reading material, influences and very different beliefs. Astonishing. Finally, the last message today came from Michael Brown. The well spoken gentleman that I interviewed at the Trump rally, his words marked the end of my meltdown. It was perfect. The storm has passed. I think I was about 12 years old when I saw the original ‘Jackie Robinson Story’. You might remember that Jackie Robinson played himself and even though it was filmed in 1950, it represented a significant attempt to record the bigotry and challenges he faced as first black major league baseball player. It would have been a Sunday. We only had over-air TV and the Sunday Matinee Movie started at two o’clock. What I remember was what you would expect. The scenes when this dignified and stoic man was verbally accosted from the stands. But as I recall, my 12 year old reaction was not directed at the bullies. I understood bullies. I had recently moved from California to Michigan and was a particularly awkward adolescent, who, if my new classmates were to be believed, resembled something of a primate. No, what I remember wondering about were the other grown ups. The ones who stood in the stands with the bullies. Weren’t they just as bad? Wasn’t their silence an indictment of the whole stadium? So today I received two emails from two family members. One explained, along with poignant photos of soldiers embracing their families, that the ACLU had filed suit to eliminate prayer from the military. Involuntary eye roll, debunk on Snopes, copy, paste, send. Then came another one explaining that, when asked what he wanted to be when he grew up, ‘little Shakiel’ answered, a ‘welfare recipient’. The email went on to present reams of data, by state, of welfare benefits to be had (you can make over $60,000 a year in Hawaii and not work a day). For an added kicker, it listed all the pension money and benefits that Nancy Pelosi and others will be enjoying ‘for life’, It took a little more than Snopes on this one (suffice it to say, the Cato Institute featured heavily), but debunk1, debunk2, copy, paste, send. Ah, technology. It is the final irony that the easier it is to research information, the more people cling to concepts and beliefs that validate their worse instincts. I used to think that the correct response was simply to supply data, apply logic and engage in discourse. It may not be that simple. For three national elections in a row, I have travelled across this country and recorded the fears that brought me these two emails. Christians convinced that their religion is under attack. People tired of their tax money supporting immigrants and lazy people who simply want not to work. Feelings so deep that facts cannot and do not impede. Yesterday I wrote about the lifelong pattern of cruelty that defines Donald Trump for me. Applying the same measure to Hillary reveals a lifetime of unrelenting public service. Imperfect. Flawed. But consistent and dogged. So I ask you this. When do we stop sitting quietly in the stands? We have watched Hillary for over 30 years in this game of politics. We have watched as investigation after investigation have revealed little or no wrong doing. It is clear the scrutiny has resulted in a defensiveness that we all might agree is understandable, if not prudent. The emails reveal that Hillary has behaved like a politician and we collectively clutch our pearls. When do we give full voice to what we see in front of us? Our silence risks giving this election to a bully who has shown a willingness to not only destroy his competitors, but the game itself. Stand up. Stand up for Hillary, the ACLU and little Shakiel’s everywhere.